Now for a true golden oldie on the market as Ben Snead at Expedition Yachts tells me he's listed the venerable 25.9m motor yacht Sea Star for sale. Built by Burger in 1965 to a design by Jack Hargrave, she’s an all aluminium yacht sleeping six guests in three staterooms. Sea Star is remarkably preserved, having been owned by yachtsmen who maintained her in top condition and was kept in a boathouse in Seattle's Lake Union from 1969 to 2007. Although she’s ready to cruise and makes annual trips to the waters of British Columbia, Ben says Sea Star is an excellent candidate for a full restoration as all of her doors, hatches, hardware and interior joinery work are original and her hull, engines and tanks are in very good condition. 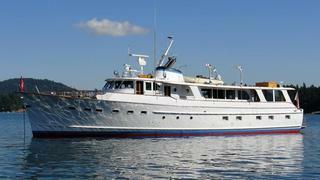 Lying in Tacoma, Washington, Sea Star is asking $685,000.